Hortus Camdenensis | Crinum flaccidum Herb. A variable deciduous species, with generally narrow, channelled leaves which tend to flop on the ground and which often die back in summer, and flattened stems, to 60cm long, bearing umbels of up to 8, fragrant, pure white or cream flowers that open widely. The bulbs can be as much as 1m below ground. [RHSD, FNSW]. Yellow-flowered forms have also been described from western South Australia and pink flowered forms from New South Wales. [Hannibal Plant Life p.46/1963]. More recently crinums with deep yellow or pink flowers have been discovered in South Australia and Queensland, some of them possibly new species. [Jim Lykos, personal communication]. 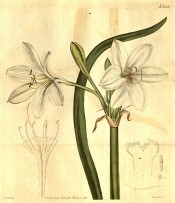 Botanically described as Amaryllis flaccida by Johann Weinmann in 1820 [Flora; oder, (allgemeine) botanische Zeitung]. Placed in Crinum by William Herbert in a review of the genus in the same year [BM t.2121/1820]. ‘The Crinum flaccidum is a native of New Holland, and was discovered in the same expedition [Alan Cunningham] that produced the purple and yellow Calostemmas, before published, “under the Macquarie Range in East longitude about 146, and about 33 of South latitude”.’ [BM t.2133/1820]. ‘A newly discovered species, which has flowered this summer for the first time in our gardens. The knowledge of it is due to a late expedition into the western interior of New Holland, in the course of which the plant was found under Macquarie Range in E, longitude about 146, and about 33 of S. latitude, a region not long since deemed inaccessible from the side of the Colony. The drawing was taken from a plant that flowered in Mr. Barnard's hothouse at Bexley; where the Calostemma purpureum had likewise blossomed in great perfection. No other species of this genus has been yet observed in all Australasia.’ Figured as Amaryllis australasicum. [BR f.426/1820]. Listed in all published catalogues [B.83/1843]. John Bidwill makes some interesting observations on the growth of Crinum flaccidum in Sydney and Camden. ‘Is a very poor plant in the sandy ground at Sydney the scapes are not more than 12 inches high, lax, with about 5 flowers – at Camden in strong [clay] garden soil they grow 2½ feet high and are quite upright. The flowers are half as large again and form a large handsome umbel of about 12 flowers (perhaps more) – At Camden it always loses its leaves in winter but not at Sydney.’ [Bidwill p.47]. Hannibal  includes Crinum angustifolium R.Br. and Crinum australasicum Herb. in his Crinum flaccidum group. [Townsville Historical Society Journal, Feb. 1967]. I assume that Crinum angustifolium var. blandum (Sweet) Baker and Crinum australasicum var. blandum Herb. are intended. [APNI]. Crinum australasicum var. blandum Herb. Taenais australasiae (Ker Gawl.) Salisb.